Brian Wilson was born in Inglewood, California, in 1942. In biographer Peter Ames Carlin’s book, Catch a Wave: The Rise, Fall, and Redemption of the Beach Boys’ Brian Wilson, he relates that when Brian Wilson first heard George Gershwin’s “Rhapsody in Blue” it had a huge emotional impact on him. As a youngster, Wilson learned to play a toy accordion and sang in children’s choirs. In his teens he started a group with his cousin, Mike Love and his brother, Carl. His named the group Carl and the Passions in order to convince his brother to join. They had a performance at Hawthorne High School, where they attended. Among the people in the audience was Al Jardine, another classmate. Jardine was so impressed with the performance that he let the group know. Jardine would later be enlisted, along with Dennis Wilson to form the Pendletones in 1961. The first song Brian Wilson wrote would become “Surfer Girl”. A demo of the tune was made in February 1962 and would go on to be a Top Ten hit when it was released a year later in 1963. However, their first recording was a doo-wop-surf tune called “Surfin’” in October 1961. It was released in November ’61 on the Candix Enterprises Inc. label. The surprise for the group was that the record label had changed the group’s name from the Pendletones to the Beach Boys. Consequently, as each time the record was played by a DJ in America, radio listeners were being introduced to the Beach Boys. The name Pendletones was now history. In 1962, neighbor David Marks joined the group for their first wave of hits with Capitol Records, leaving in late 1963. In 1965, Bruce Johnston joined the band when Brian Wilson retired from touring to focus on writing and producing for the group. The Beach Boys signed with Capitol Records in July 1962 and released their first album, Surfin’ Safari, later that year. The album spent 37 weeks on the Billboard album chart, launching the young group known for its shimmering vocal harmonies and relaxed California style into international stardom. The Wilson/Love collaboration resulted in many huge international chart hits. Under Brian Wilson’s musical leadership, the band’s initial surf-rock focus was soon broadened to include many other themes, helping make The Beach Boys one of America’s most successful bands of the 1960’s. The Beach Boys charted 13 Top Ten hits into the Billboard Hot 100 in the ’60’s. This began with “Surfin’ USA” in 1963. The only American pop group in the 1960’s who had more songs chart into the Top Ten on the BillboardHot 100 was The Supremes, who had 18 singles reach that threshold. Though, in Vancouver, The Beach Boys had 23 songs chart into the Top Ten while The Supremes charted 18 songs into the Top Ten in Vancouver on either CKLG or CFUN, making The Beach Boys the top charting American band in Vancouver during the decade. Among the Top Ten hits The Beach Boys charted in Vancouver were “I Get Around” (#3) “Don’t Worry Baby” (#3), Help Me Rhonda” (#2), “Sloop John B” (#2), “Wouldn’t It Be Nice” (#1), “Good Vibrations” (#1) and “Barbara Ann” (#2). In the midst of their string of hits, the Beach Boys charted “Little Honda”, a #3 hit in Vancouver in the fall of 1964. Their next single was “Dance, Dance, Dance”. The B-side was “The Warmth Of The Sun”. “The Warmth of the Sun” was one of the tracks on the Beach Boys fifth studio album, Shut Down Volume 2. The album cover featured the group standing around several hot rods, including a Corvette Stingray and a Pontiac Grand Prix. Both cars on the album cover were owned by Dennis and Carl Wilson. The album was released in early March 1964 at the start of the British Invasion and the height of Beatlemania. On Cashbox Magazine’s weekly singles chart The Beatles would top the charts for 17 of 18 weeks between January 25 and May 23, 1964. With Capitol Records trying to keep pace with the hysteria over the Beatles, less time was devoted to promoting the Beach Boys latest album. The first single released from Shut Down Volume 2 was Fun, Fun, Fun. It stalled at #5 on Billboard and #6 on Cashbox with the Beatles claiming the Top Four positions on March 28thand the Top Five positions on April 4/64. 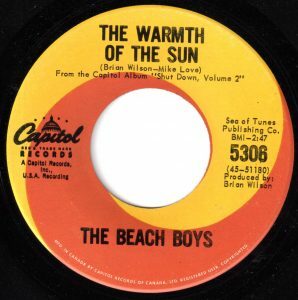 The a-side to “The Warmth of the Sun” was “Dance, Dance, Dance.” The later was a track that found it’s way onto the Beach Boys eighth studio album, The Beach Boys Today. It was recorded on October 26, 1964, while “The Warmth of the Sun” was recorded on January 1, 1964. 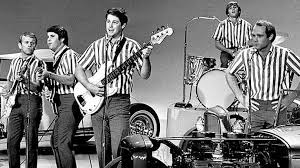 Since Brian Wilson and Mike Love had been up past 2:00 a.m. on November 22 1963, they slept in past noon. Love remembers waking up to the news that President John F. Kennedy had been shot. When the Beach Boys recorded “The Warmth Of The Sun” on January 1, 1964, the recording was charged with emotion. The band recalled the day they wrote the song and it has forever been fused with the memory of the news of the assassination of JFK. The song is about a person in love with someone who “doesn’t feel the same way.” Nonetheless, they dream of her arms knowing though the relationship is over, their love will never die. The simile the Beach Boys offered struck home with Vancouver radio listeners and many bought the single for the b-side as much as the a-side. It peaked in Vancouver at #6, while in San Jose, it climbed to #1. The only other notable chart run in a radio market was in Hartford (CT), where it peaked at #9. The Beach Boys were at the top of their popularity into the mid-60’s. They released their hit album, Pet Sounds, in May 1966, with the hits “God Only Knows”, “Wouldn’t It Be Nice” and “Sloop John B” all doing well on the pop charts, especially in Vancouver. It was their ninth of ten successive albums that made the Top Ten in the Billboard 200 Album charts. 1966 was also the year The Beach Boys that “Good Vibrations” became their third #1 hit in three years. From 1967 onward, The Beach Boys chart successes were sporadic. However, they have continued to tour over the decades. They have had four singles – “Good Vibrations”, “California Girls”, “In My Room” and “I Get Around” – and one album, Pet Sounds, inducted into the Grammy Hall of Fame between 1994 and 2017. Between May 13, 2017, and September 21, 2018, The Beach Boys have scheduled 54 concert dates across twenty-one states in the USA, as well as concert dates in Canada, the UK and Ireland. Mike Love, JFK and the Story Behind “The Warmth of the Sun,” Huffington Post, New York, November 21, 2013.